L.A. performer Banks will come out as a Goddess with her debut album next month. First, she upped her profile significantly with a televised performance. The young singer made her network television debut with a performance on Jimmy Kimmel Live!, where she looked right at home while she powered through the singles "Beggin' for Thread" and "Waiting Game." Backed by a percussionist and a synth player, it was mostly Banks who dominated the attention of the outdoor crowd. 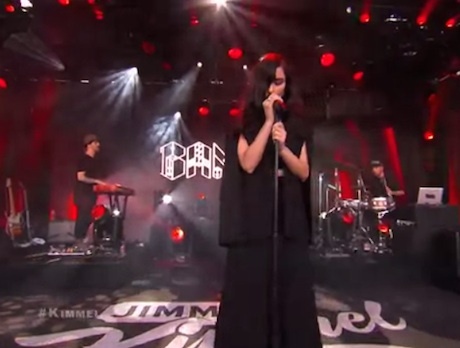 Watch Banks perform on Kimmel below. Goddess arrives on September 9 via Harvest Records.